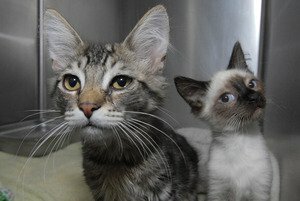 Three people have been charged in connection with a cat hoarding incident that occurred in a trailer park located in Halfmoon, NY. More than 130 felines were taken to the Saratoga County Animal Shelter after they were found living in deplorable conditions inside a single home in the park. Two of the cats that were removed from a trailer home in Halfmoon, New York. Shelter supervisor Dan Butler, a 32-year employee, said he has never had so many animals brought into the facility at once. Two cats were found dead upon a police search of the trailer and 19 were euthanized due to health-related issues. Arthur C. Millard, 53, Earl J. Millard, 26, and Mary A. Ryan, 61 (see below), were charged with one count of failing to prove proper sustenance (a misdemeanor) and one count of failure to provide animals with vaccinations (a violation of state public health law); if found guilty, they could face a maximum of one year in prison and a $200 fine. According to the Saratogian, the Millards are father and son; Ryan is Earl’s aunt and Arthur’s sister-in-law; all three lived in the trailer at one point in time. CatTime.com first reported on the incident last week. From left: Arthur C. Millard, Earl J. Millard, and Mary A. Ryan have been charged after 130 cats were discovered in a trailer home.